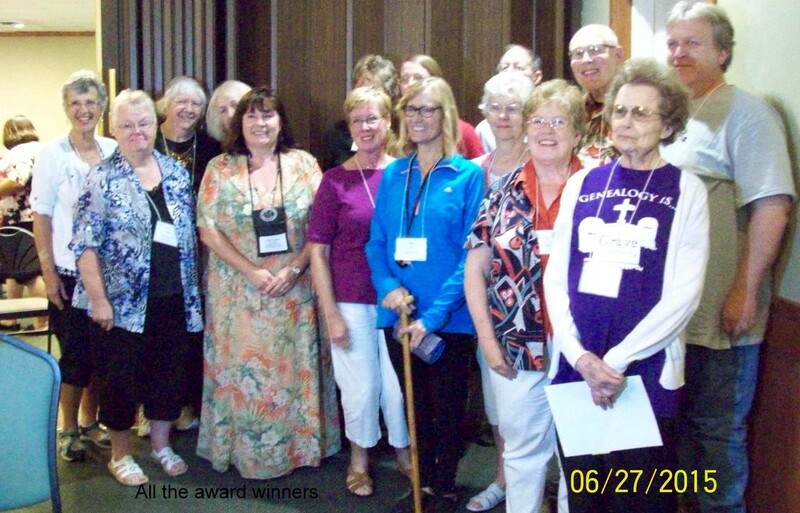 To read each individual’s accomplishments and why they were nominated, visit the Outstanding Volunteer Awards Program page. 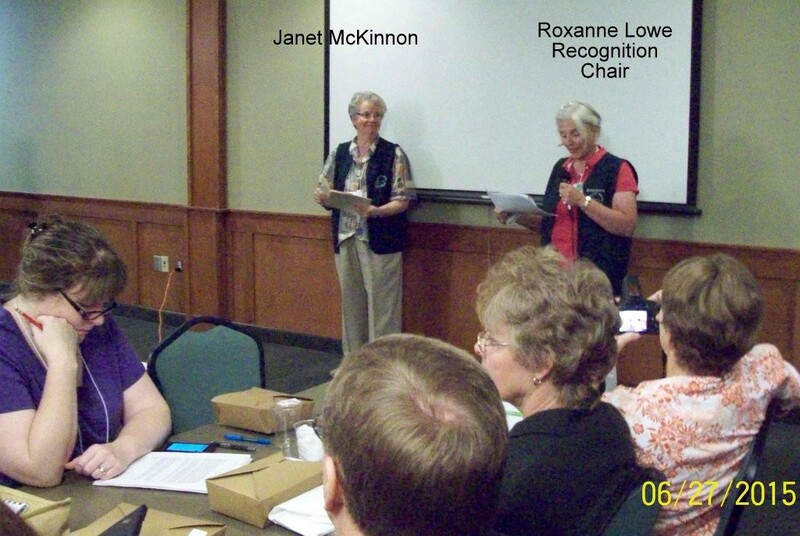 For more information about the Outstanding Volunteer Awards Program, contact Roxanne Lowe at Roxanne@thekeeffes.com. 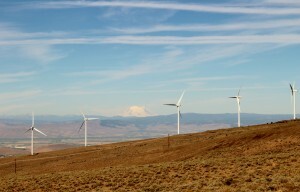 Mention it because Washington is in the grip of a most unusual heatwave. It’s been really hot……. with temps that we don’t usually get until August. Maybe. It was 105 in Ellensburg; 109 down at the bridge and 104 here in Spokane. The fire season is going to be awful; they’ve already had hundreds more so far in 2015 than last year….. and it’s only June. But you have weather awfulness in your part of the world too. The speaker at our conference was David Rencher. Lucky for us, his wife has ties to the area and so he was agreeable to coming. David has been a “bigwig” with FamilySearch for 34 years and he KNOWS his stuff. 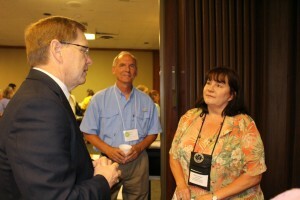 He started us out with questions: “Have you a tough genealogy problem? Worried you won’t solve it in your lifetime? Do you keep doing the same-old-same-old things and wondering why you have no new conclusions or answers? He then told us how to “frame the problem differently.” Simply put, how to look at the problem differently. His point with these images of the Golden Gate Bridge is that, with regard to your tough genealogy problem, you’re looking at the bridge as your drive on it. That’s all you see. But if were to see it from a boat or from the air, you’d have an entirely different perspective. You “must frame your picture differently” and then from that new angle you might see things that you did not see before. Like looking at the Golden Gate Bridge from three different angles. Does this make sense to you? It did to me. Of course the next question begs, how to you do this?? 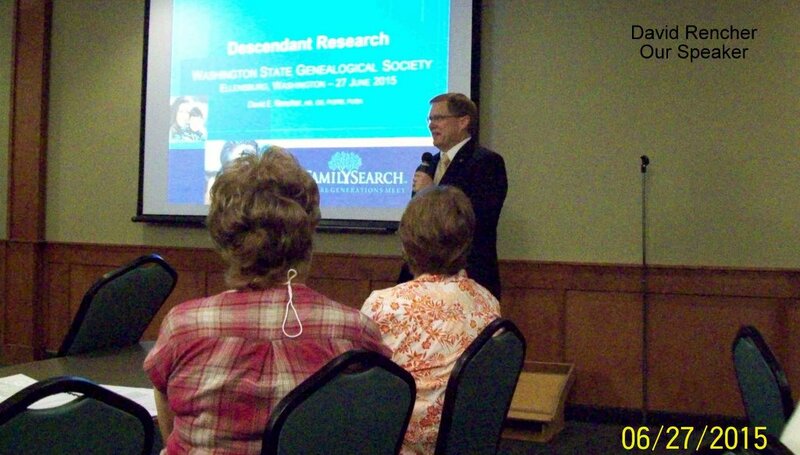 Then David launched into the main theme of his talk to answer this question: descendant research. Some cousin, near or distant, might just have the answer, Bible, quilt, certificate, watch, tool, photo, letter or clipping that you so desperately seek. 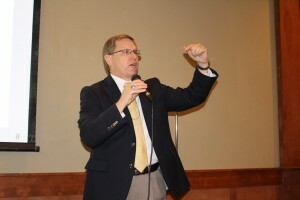 He ended his remarks by recommending a cousin-finding-connecting website called Puzilla (www.puzilla.org). With this website you can literally find dozens of cousins. See the image? Picture you as the center dot and the lines radiate out to cousins!! Another website that does pretty much the same thing is Kinpoint (www.kinpoint.com). I’ve mentioned that before. My sister Jacque had set the alarm for 5 a.m. but I woke up just before the alarm went off. Our air conditioner was working good, so good we had turned it so it was not so cold. Got up checked my E-Mail and blogs and even had a few minutes to digitize a few records for Scribe at the Washington State Digital Archives. Took all my morning and noon pills and headed for breakfast. Jacque had called on Monday to confirm our reservation and to see what our complimentary breakfast included, but we had found out while waiting for our room to be ready the day before that the complimentary breakfast was no longer being offered even though the sign by the restaurant entrance said complimentary breakfast when we went in, but was turned around when we left. Registration was open just after breakfast. 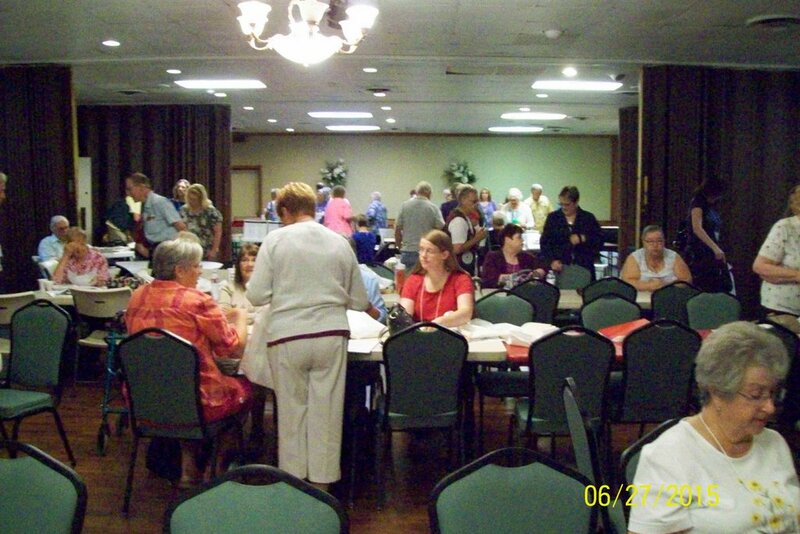 People finding a seat before the conference started. Mikal McKinnon the WSGS President Welcomed everyone. Roxanne Lowe my fellow blogger taking a lot of photos. 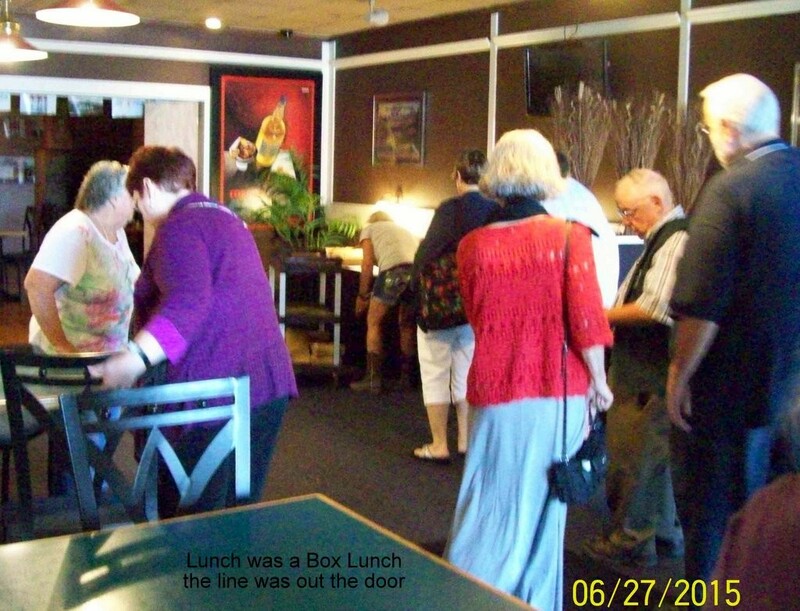 We were getting a box lunch, and the line was pretty long, but the tuna sandwich was good. 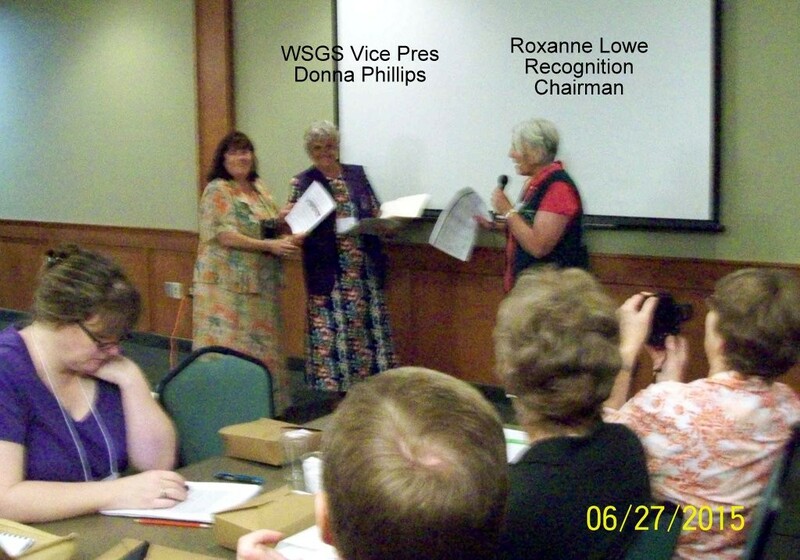 After Lunch was the annual WSGS meeting and then the awards for volunteers, communication, innovation, and the Presidents Award. 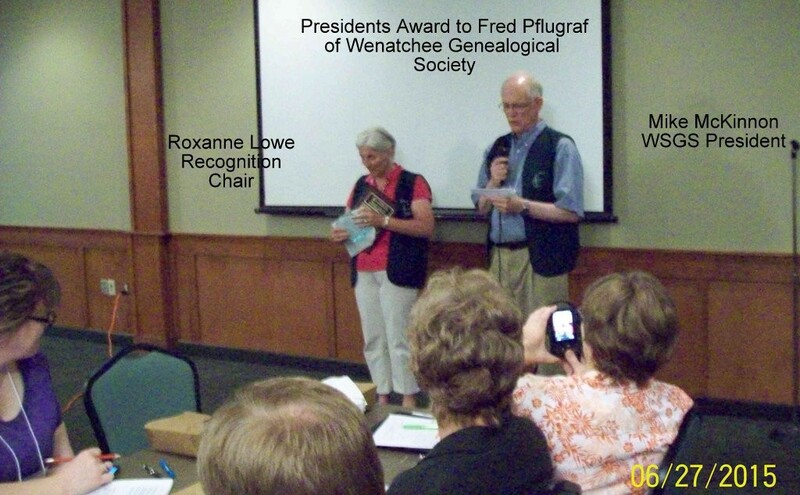 After the last presentation by David Rencher, we headed for the HOT car and then on to Wenatchee to see our cousin Clara Watson. 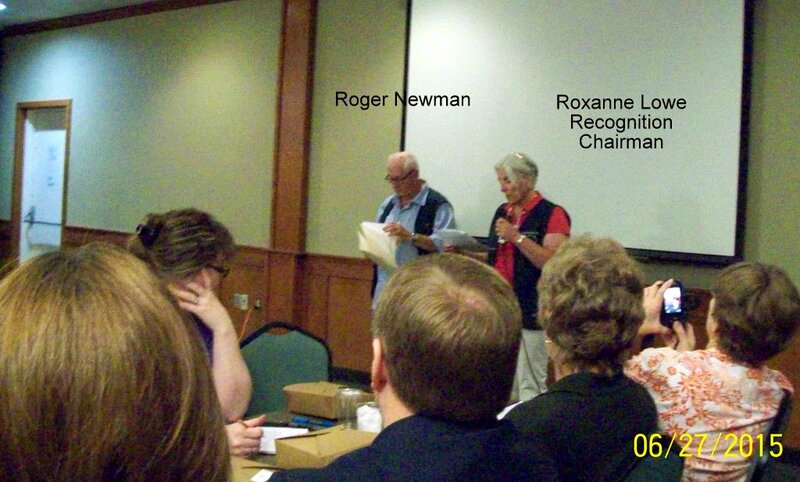 She is in a nursing home in Wenatchee and her daughter Becky was there also. That was a big surprise as she lives in Las Vegas. She said it was 108 in Las Vegas, and so the 105 in Wenatchee was cooler. Got home and was surprised that the pie cherry tree was about half ripe, so picked about a gallon of pie cherries. Only 102 In Spokane when I got home. Since it was supposed to be hot on Friday June 26, 2015 we wanted to start early to get to Ellensburg before it got hot, but as usual we got going about 8:30 a.m. It was hot before we even got out of town, and by the time we got to Ritzville it was even hotter. 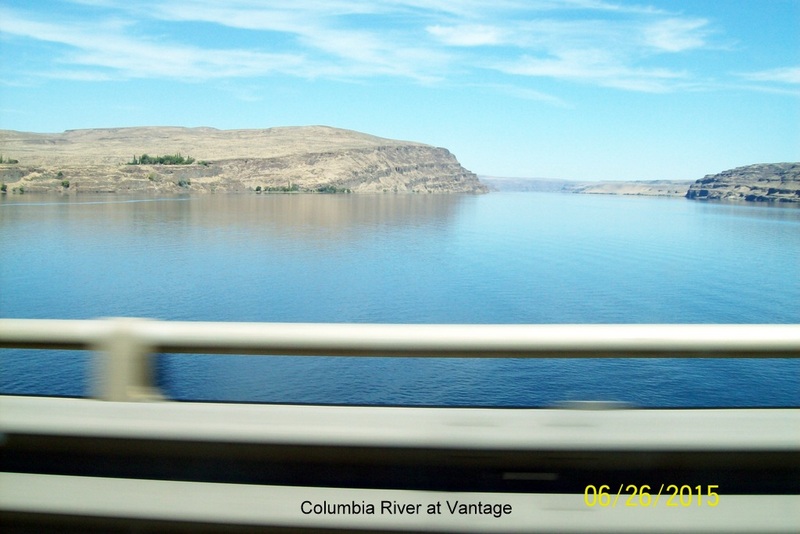 At Vantage the wind was very calm down by the river. 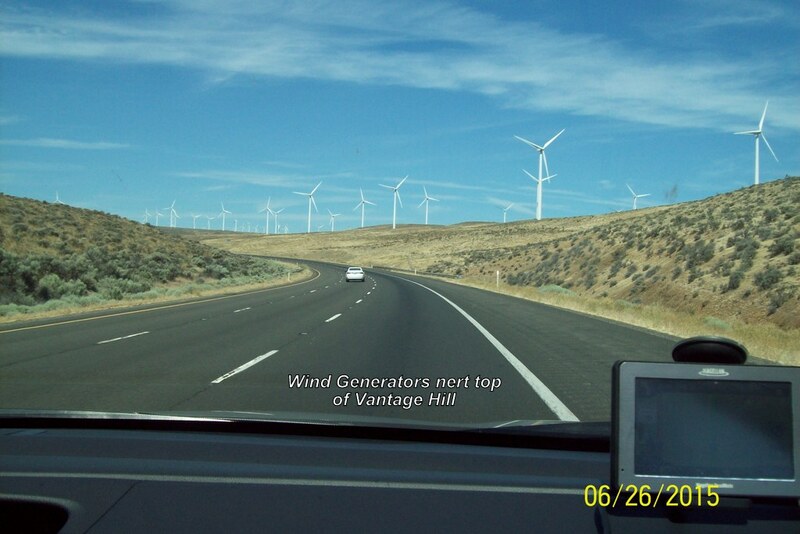 But as we climbed up from the river toward RyeGrass Pass the wind generators were nearly all turning. I guess with so little water to generate electricity they are using as much wind power as they can to save the water behind the dams. 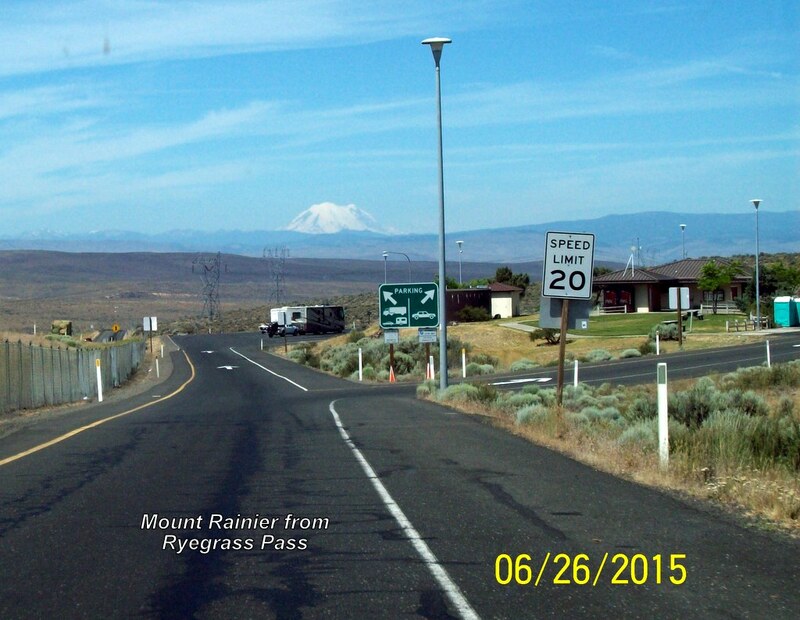 At the Ryegrass rest stop Mount Rainier came into view and it looks so cold at the top. We got to Ellensburg and drove right past the Quality Motel, and turned around and found it this time. Since we were very early we went into the attached restaurant and had a milkshake, sure was nice on a hot day. Checked to see if we could check in and they were not ready for us yet. Frank McLean came in about then and we talked a little and looked at the rooms we were going to be in for the conference. We got to get our registration packets while we waited for our room to be ready and finally just before 3 p.m. our room was ready, so we checked in, and carried the suitcases and everything else we had from the hot car to our room. 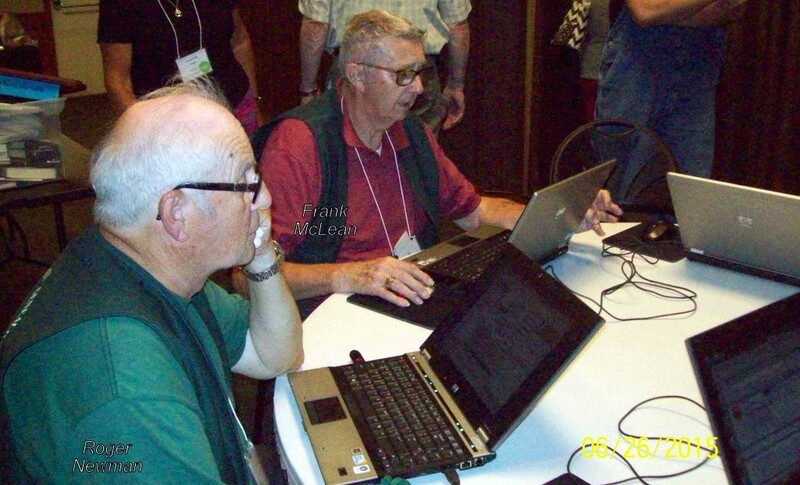 I then went to the WSGS board meeting, all members are welcome at the board meetings, and after the board meeting the the computer lab was set up. 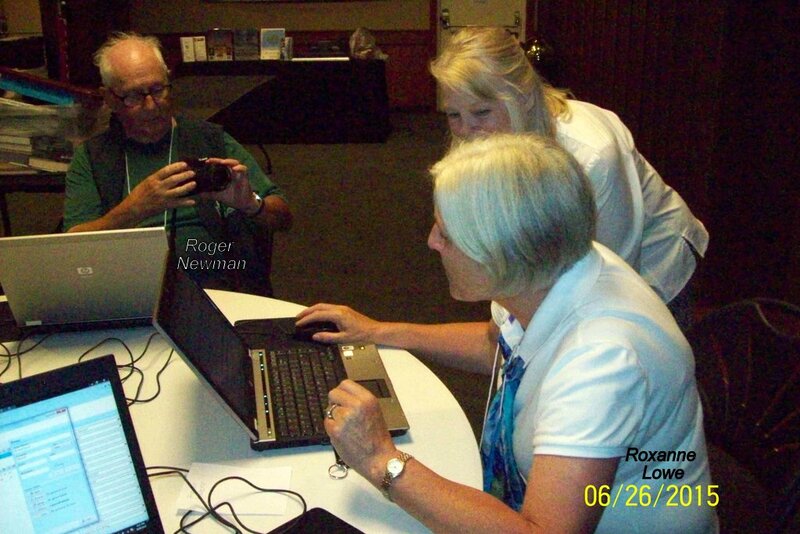 Roxanne Lowe, Roger Newman and Frank McLean at the computer lab. 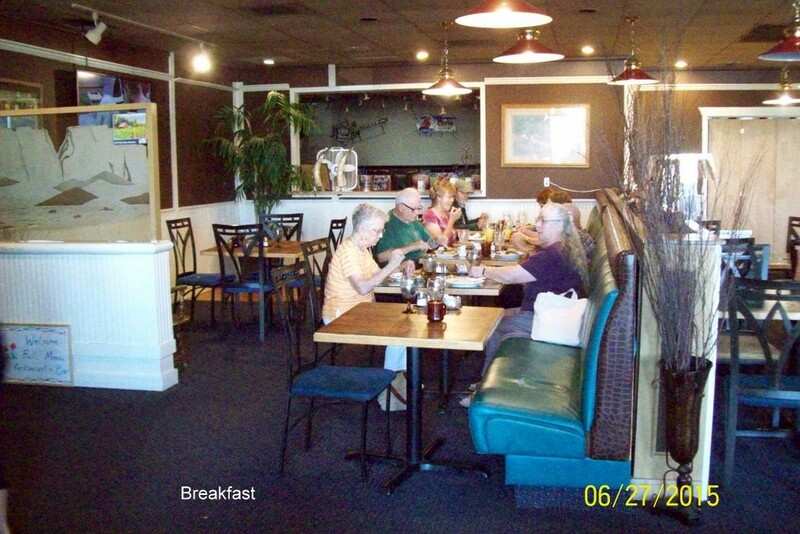 Got hungry and found a few other board members and had dinner. Then back to our room to check out the WIfi and get to bed since day two starts early. One of our friends from Spokane had been told the WIfi was not working and would be fixed till Monday, but it worked fine in our room. 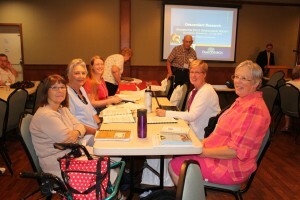 Want to Share Your Conference Photos? 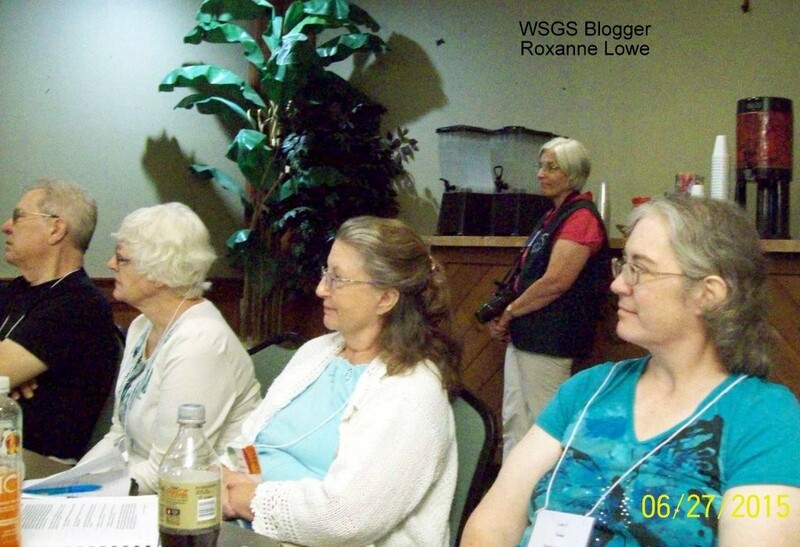 I saw a lot of cameras and cell phones taking photos at our WSGS Conference in Ellensburg. Would you like to share them with our Blog readers? 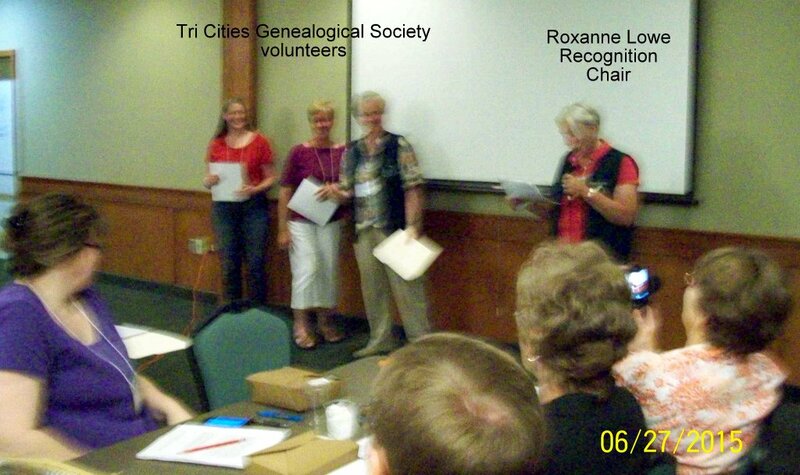 Or do you want to broadcast information about your local society, workshop, genealogical tip, or a research query? 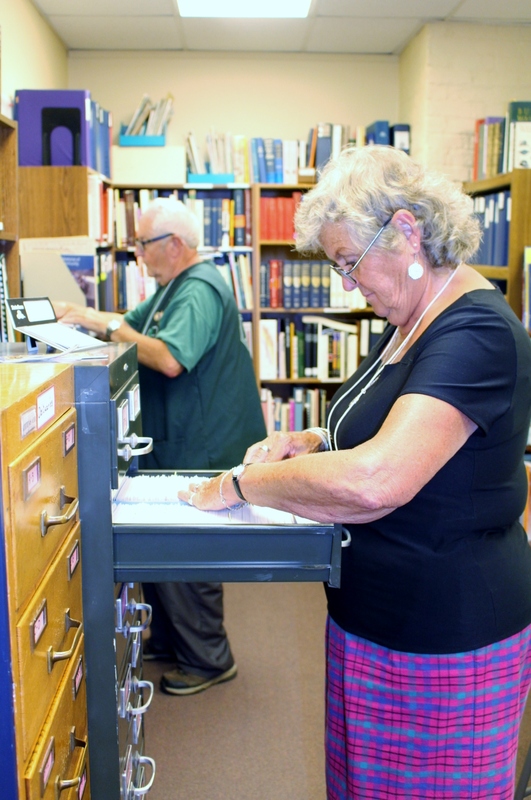 You can reach hundreds of genealogists from around the state. 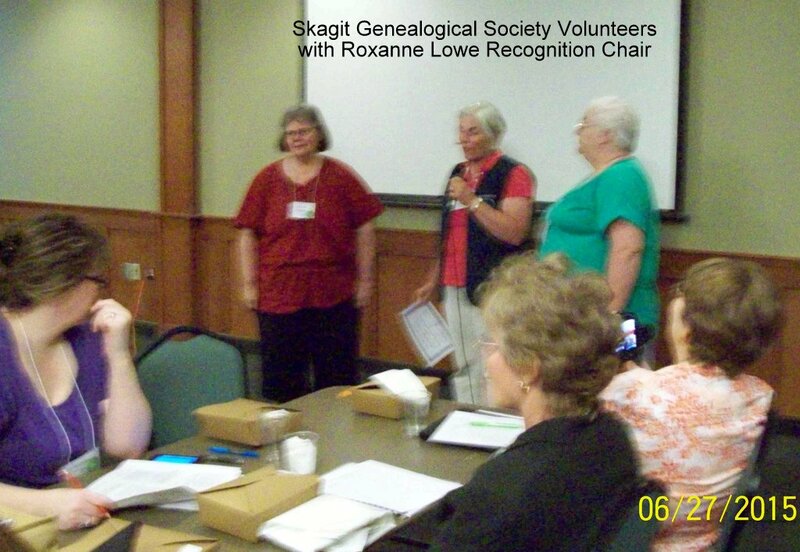 Just email your photo, Word document, text file, or PDF to WSGSBlog@wasgs.org and the blog masters will do the rest. What an opportunity to ask questions — and get some answers! David sprinkled his talks liberally with stories and quips — very entertaining! 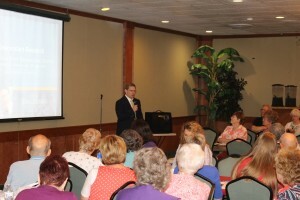 What a great speaker — professional, humorous, and quite the storyteller. I came home (in my air-conditioned car!) with my brain swirling with new research possibilities (maybe I will be able to find my Catholic Daniel Murphy with no middle name in Ireland! 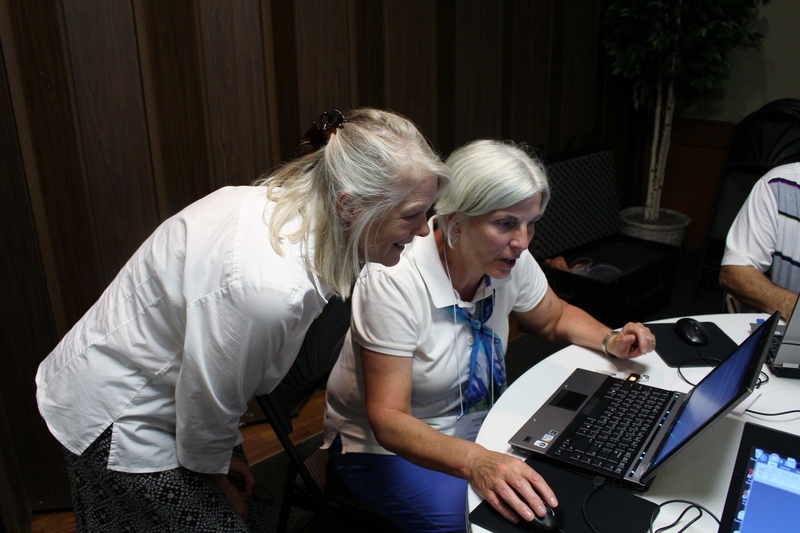 ), appreciation for FamilySearch’s commitment to make billions of records available for free, and how their dedicated staff and thousands of volunteers digitize, index, and quality-check those records. Also learned about the partnerships FamilySearch has developed with Ancestry.com, FindMyPast, and MyHeritage — all for the benefit of genealogists around the world. And don’t get me started on how cool the FamilySearch Wiki is and the mobile apps! 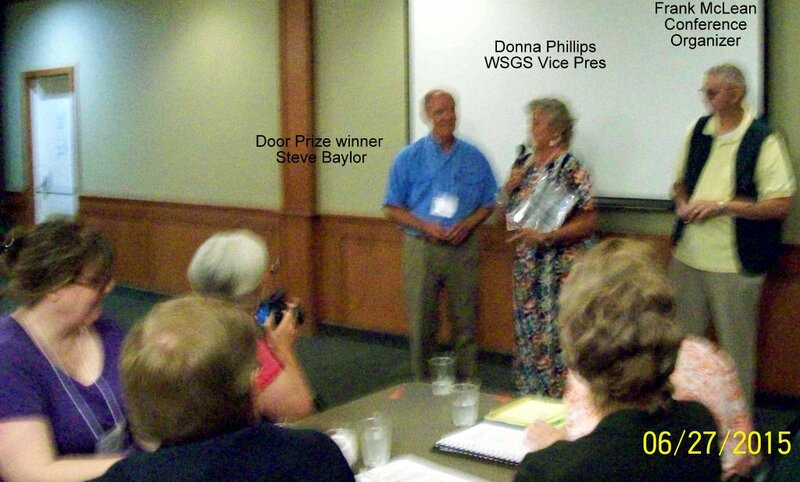 Watch this blog for more posts about the conference, including the awards that were presented. A great day! Despite the sizzling heat (103 degrees today and hotter tomorrow!! ), I had a great day filled with all kinds of adventures. 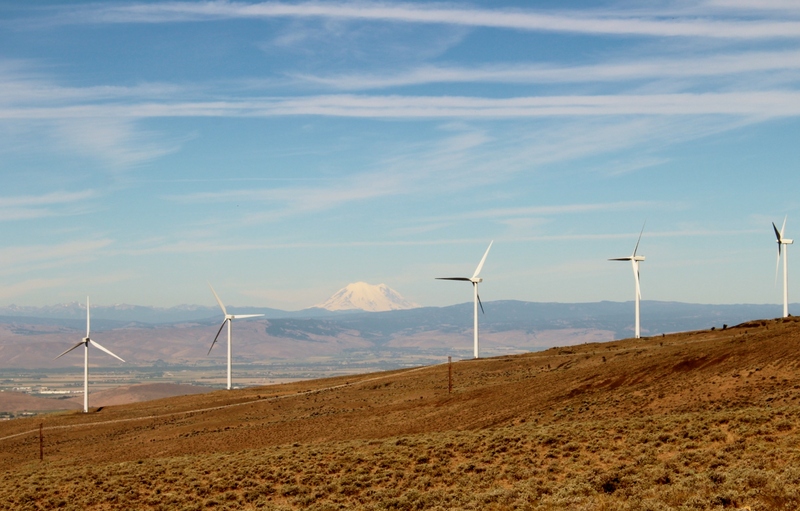 After viewing a few more barn quilt blocks, I toured the Wild Horse Wind Facility, where I got up close and personal with 149 gigantic wind turbines that can generate up to 273 megawatts of electricity, enough to serve more than 80,000 homes. Great tour with killer views of Mt. Rainier (pictured), Goat Rocks, Mt. Adams & Mt. Hood. Incredible. 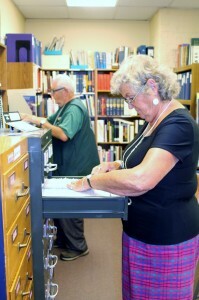 Roger Newman and Donna Potter Phillips taking advantage of Kittitas County GS’s research library. Spent some time at the Central Regional Branch of the State Archives where we got a personal tour of the facility. 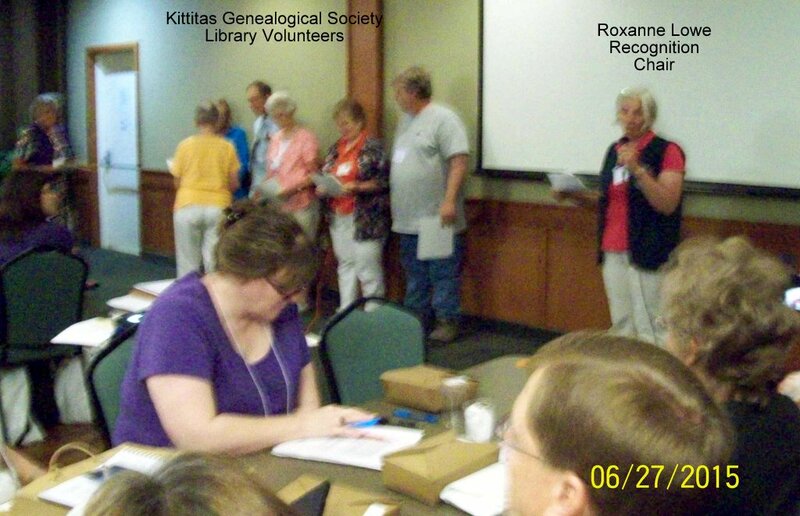 After a quick WSGS Board Meeting, it was off to Kittitas County Genealogical Society’s open house at their wonderful library. Closed the day at the computer lab test driving genealogical software programs, including Roots Magic, Legacy, and Family Tree Maker. 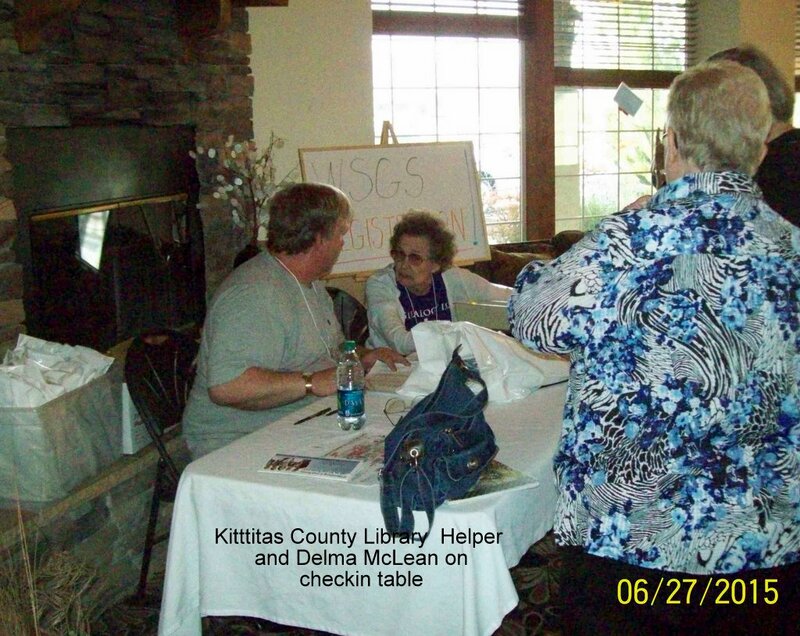 Kittitas County GS President Diane Huckabay explaining the nuances of the Legacy genealogical software program to Roxanne Lowe. A full day getting revved up for tomorrow’s main event: WSGS Conference featuring David Rencher. 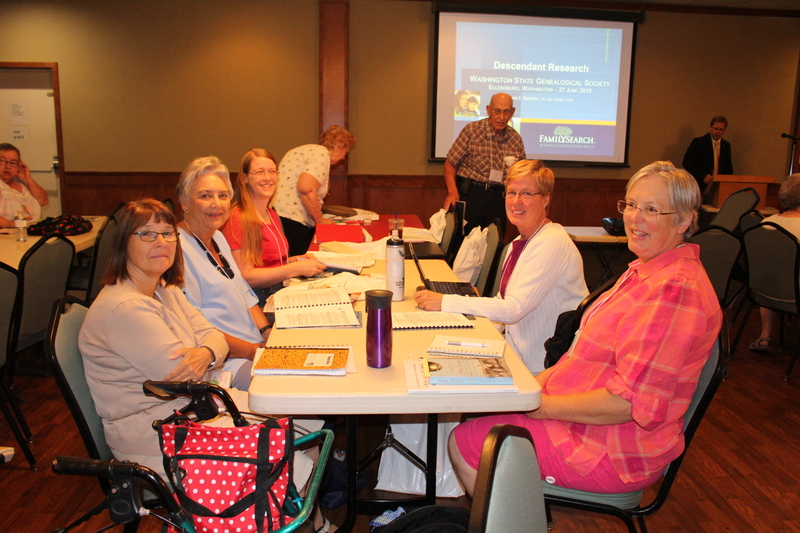 I’m in Ellensburg, getting ready for Saturday’s State Conference featuring David Rencher, FamilySearch’s Chief Genealogical Officer. Today’s highlight was a self-guided driving tour (actually my friend & WSGS Vice-President Donna Potter Phillips was my navigator) of the Kittitas County Barn Quilt Trail. Saw a dozen painted quilt patterns on barns, sheds & outbuildings. Beautiful. In honor of David’s vast experience with Irish genealogy, here’s a picture of the Celtic Knot quilt block on the P&B Hay barn. More tomorrow. Have you registered to hear David Rencher, FamilySearch’s Chief Genealogical Officer, talk about “Strategies and Visions for the Future”? It’s not too late!! Here’s the brochure and how to register. I’m so looking forward to meeting and greeting David, but I’m also going to take advantage of some other great happenings! On Thursday, I’m going to take a self-guided driving tour of more than 100 large quilt squares painted on the side or end of local barns. 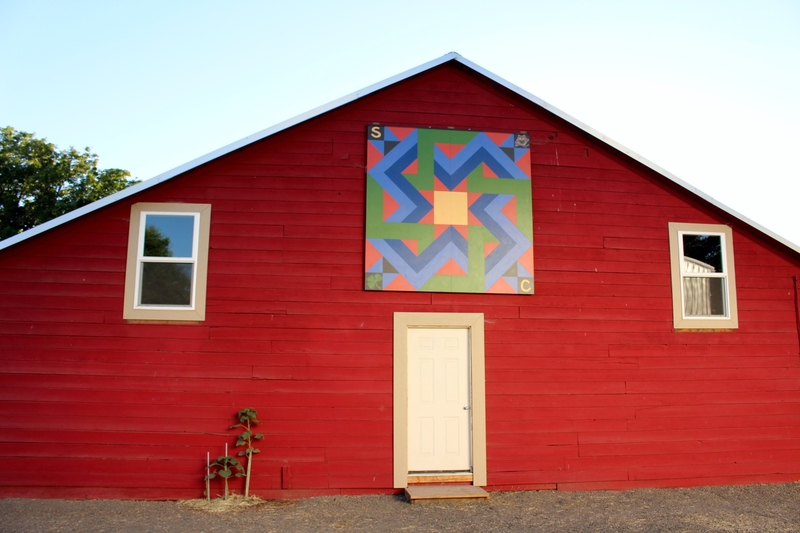 The Barn Quilt Trail celebrates the area’s agricultural heritage, as well as the folk-art of the American quilt. 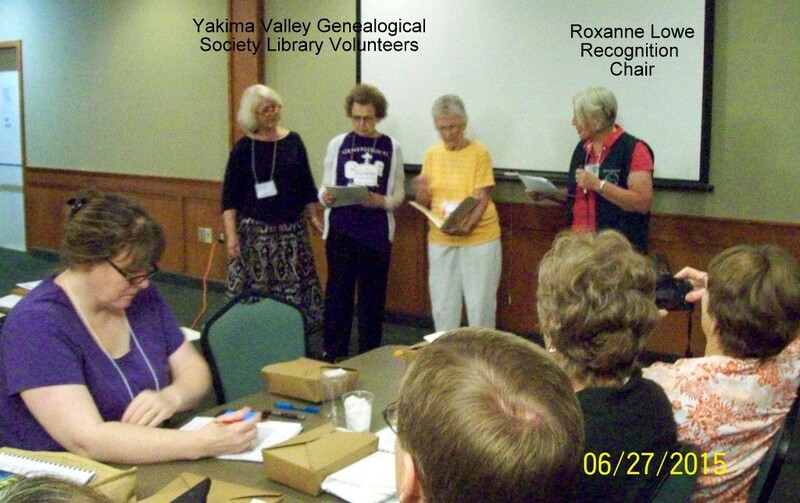 On Friday, I’m going to tour the Central Washington branch of the Washington State Archives sometime between 1:00 – 4:00 p.m., then I’ll drop by the Kittitas County Genealogical Society open house at their Research Library, 413 N. Main Street, from 4:00 -6:00 p.m. And THEN, I’m going to visit the Computer Lab that’s set up at the Quality Inn (conference headquarters, 1700 Canyon Road, Ellensburg) from 6:00 – 9:00 p.m. to check out four of the most popular genealogical software programs: Family Tree Maker, Roots Magic, Legacy, and PAF. 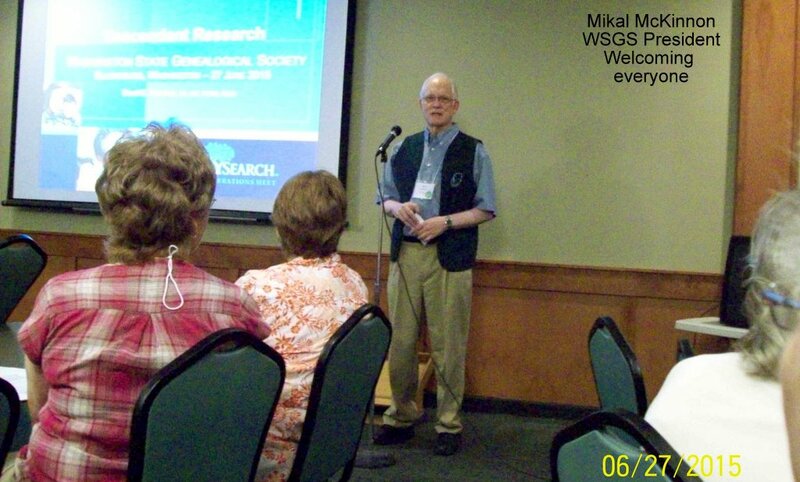 I’ll have my research (GEDCOM format on a flash drive) to test drive the programs. Experienced users will be there to help me. On Saturday, I’ll be up bright and early (okay, maybe just early…) to grab breakfast before spending the day learning about the future of genealogy and networking. 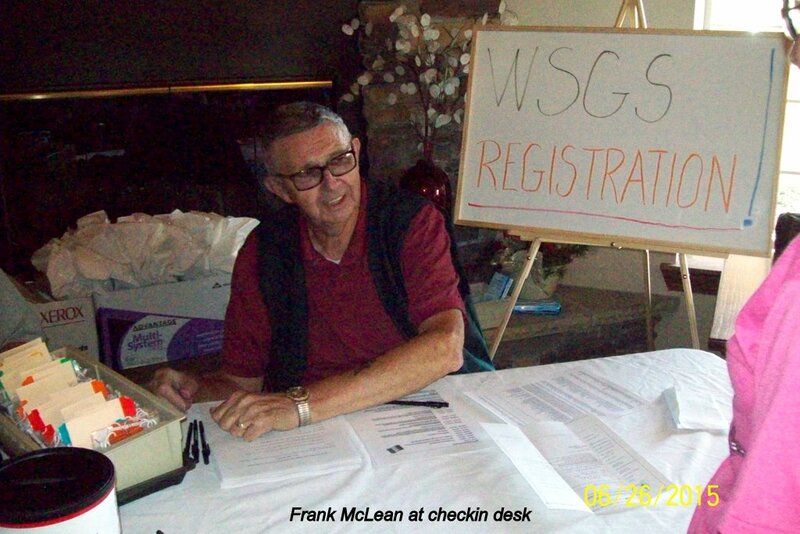 During the day, I’ll also be staffing the WSGS information table (stop by to say hi!) and presenting awards at the Annual Meeting to Outstanding Volunteers and Teams, Outstanding Project, Outstanding Communication, the President’s Award and the Innovative Grants to amazing projects sponsored by local societies. Visit this Blog and our new Facebook page often — the Blogging and Facebook teams will be posting pictures of the festivities! David Rencher, the headliner at the 2015 WSGS Annual Conference on June 27 in Ellensburg, is a pretty interesting guy. 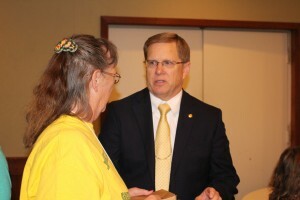 Besides being the Chief Genealogical Officer at FamilySearch, he has a veritable alphabet book behind his name. 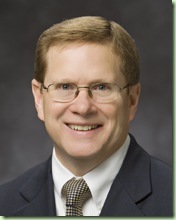 And don’t overlook that he’s the past President of FGS (Federation of Genealogical Societies) and has a BA (Bachelor of Arts) in Family and Local History from BYU (Brigham Young University). He’s a Seahawks fan and will be watching for another trip to the Super Bowl in February 2016. Washington potatoes are some of the best in the U.S. David’s favorite potato dishes are Potato Salad and Funeral Potatoes. While his favorite apple is the Golden Delicious, he’s a Windows user (sorry, Apple!) and is bringing his trusty Lenovo computer with Windows software for his presentations. Want to know more about David, register for the WSGS Conference NOW!